The Carb-Sane Asylum: Is Metabolic Adaptation Real? Study 1 of ? Is Metabolic Adaptation Real? Study 1 of ? 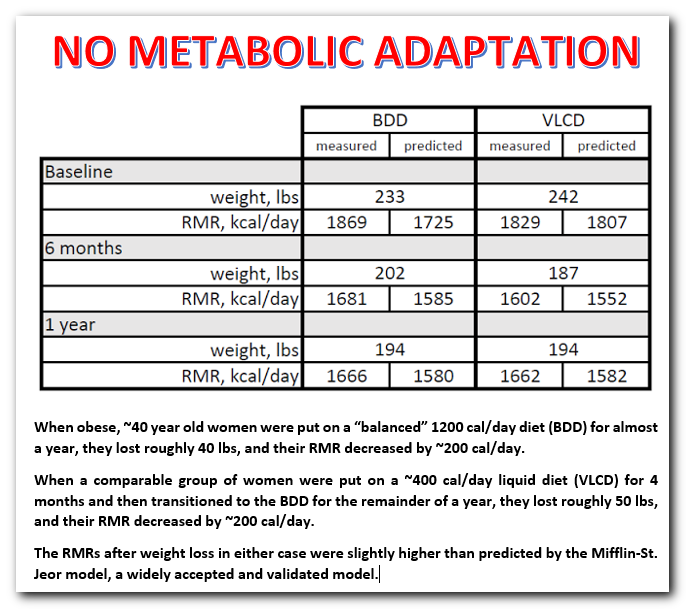 The magnitude of metabolic adaptation increased 6 years after “The Biggest Loser” competition. This was surprising given the relative stability of body weight before the follow-up measurements compared with the substantial negative energy balance at the end of the competition which is known to further suppress RMR (15,16). 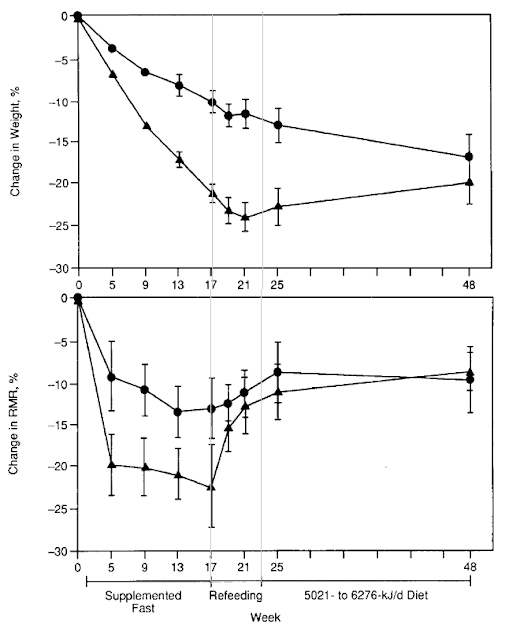 (1) ... neither dietary regimen , combined with modest physical activity, was associated with long-term reductions in resting metabolic rate that exceeded decreases anticipated with the achievement of a lower body weight . (2) Energy restriction produces a transient hypothyroid-hypometabolic state that normalizes on return to energy balanced conditions. Failure to establish energy balance after weight loss gives the misleading impression that weight-reduced persons are energy conservative and predisposed to weight regain. 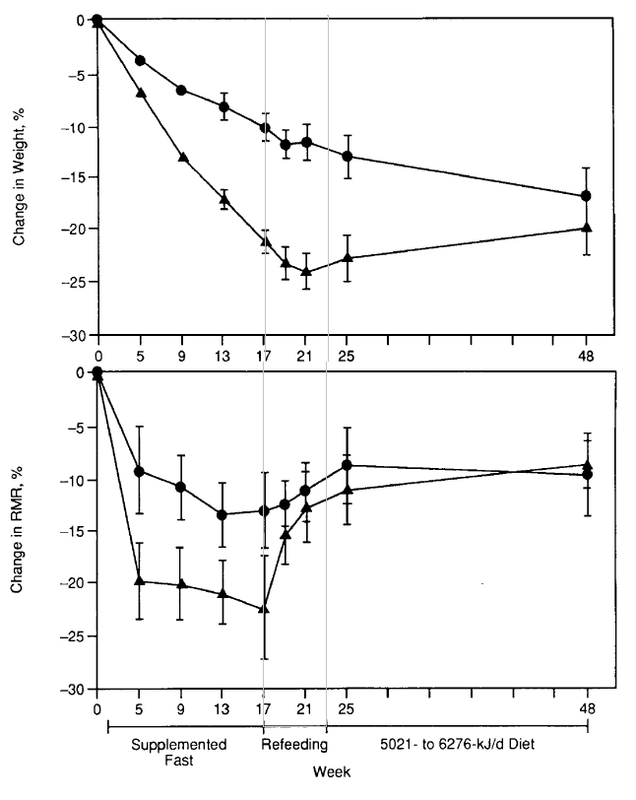 Our findings do not provide evidence in support of adaptive metabolic changes as an explanation for the tendency of weight-reduced persons to regain weight. TRANSLATION: The results in TBLR were in stark contrast to those in these two studies. 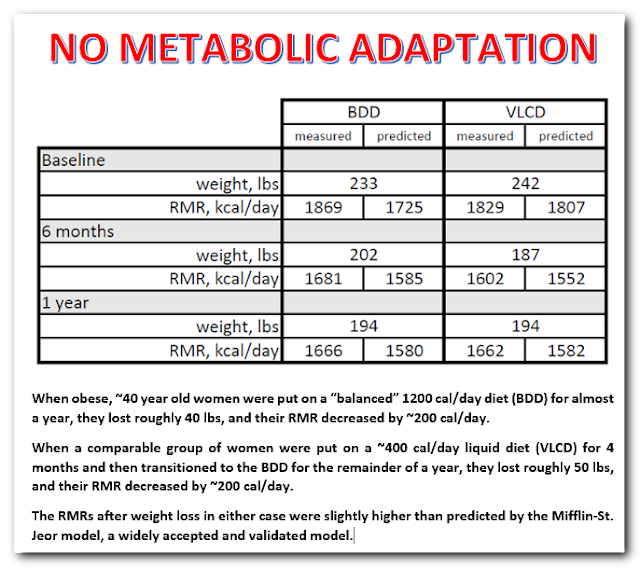 There was no metabolic adaptation in these studies. For the non-metrically inclined, these women averaged 5'5" tall and around 235 lbs ... of interest, their resting metabolic rates were around 1850 cal/day, which is roughly 100 cal/day more than predicted by Mifflin St-Jeor for this "average subject" using 38 for the age. In other words, normal. BDD = Balanced Deficit Diet: 1200 cal/day of 15-20% protein (45-60 grams), 50-55% carbohydrate (150-165 grams), and 30% (40 grams). Self-prepared (with provided measuring devices) conventional foods. Averaged diaries appear to support compliance. 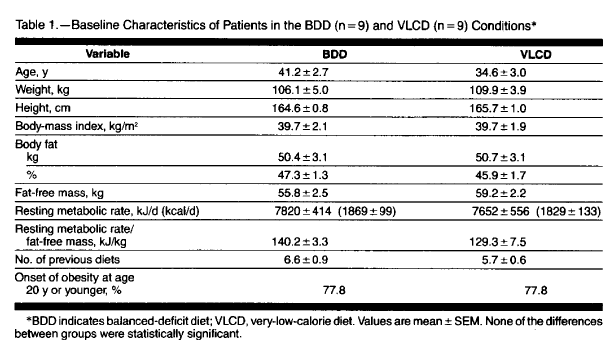 VLCD = Very Low Calorie Diet: 420 (not a typo!!!) cal/day "Optifast 70" consisting of 70 g of protein, 30 g of carbohydrate, and 2 g of fat. 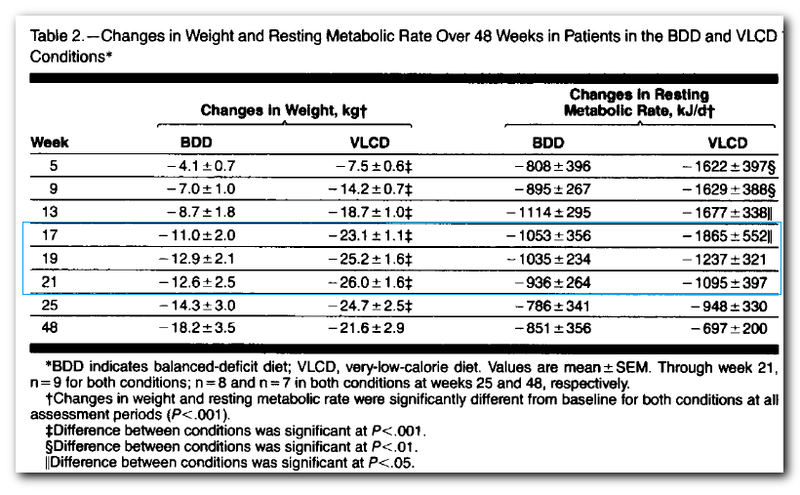 The BDD group consumed their diet for the full 48 weeks of this study. 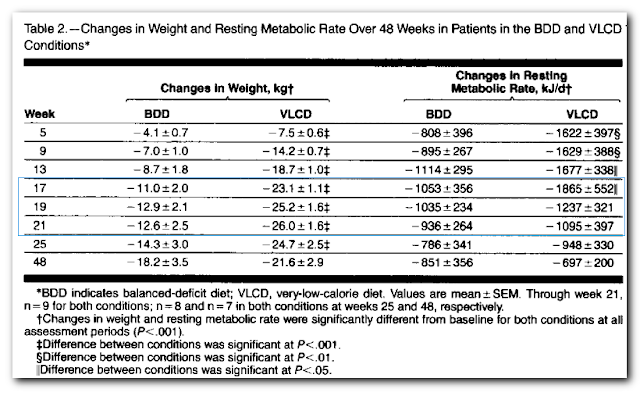 The VLCD group diet was as follows: (1) Week 1 of BDD to acclimate, (2) Weeks 2-17 = 16 weeks of VLCD, (3) 6 week ramp up Weeks 18-23 reintroducing conventional foods and phasing out formula, (4) BDD diet at 1200-1500 cal/day similar to the BDD group for Weeks 24-48. Diaries kept during stage (4) but no mention of other times. ... neither dietary regimen , combined with modest physical activity, was associated with long-term reductions in resting metabolic rate that exceeded decreases anticipated with the achievement of a lower body weight . Which brings me now to the discussion of interpretation of these studies. There are numerous metabolic rate estimation equations out there, off the top of my head the most common are Harris-Benedict, Mifflin-St.Jeor and Katch-McArdle, but let's also not forget Kevin Hall's own NIH work and his body weight simulator. Instead of reporting individual results in the context of any of those models, the new crop of "metabolic adaptation doom" studies prefers to use a regression line on the (often few) subjects in the study. They then slide down that line to the new weight and claim that is the "predicted RMR". In this study, they did what should be done: compared the metabolic rates to those that would be predicted for the subject's anthropometrics. Here's my summary from the data of what happened (same table from top of the post). I entered the baseline and reported data in metric units directly into a simulator based on Mifflin-St.Jeor. Weights are converted to pounds in the table for convenience. For 6 months I used 25 weeks, and rounded 48 weeks to 1 year for summary purposes. Which begs the question as to why this is, and older studies such as this one are mentioned only in passing, or not at all. I have some ideas as to why, and hope to expand on them soon. But this is one of the most bothersome outcomes of the rather not-so-good Biggest Loser study, and the horrendous doom and gloom headlines and media reports it generated. Metabolic adaptation is a valid hypothesis to explain why some obese seem to be unable to lose weight or lose enough weight. It could go a long way to describe failure rates for maintenance. But even in the Biggest Loser study, it was those who "adapted" the most who kept the most weight off. We don't hear much about that because it does not fit the developing narrative. To those who have lost a lot of weight or need to, I present this study, and I hope to add others in the coming weeks or months. Yes, you'll have to eat less than you used to when you weighed more or what you do when you are currently obese. Fact. But there's more convincing evidence out there that it won't be less because you dieted down to that weight, than exists evidence for some cruel adaptation where you'll either be hungry all the time or regain all the weight. You'll likely be able to eat at the same levels as your "naturally thin" friends who never gained the weight. (I'm not saying this will be easy or won't require more deliberate effort than for others.) Regain is NOT inevitable as the narrative is pushing.